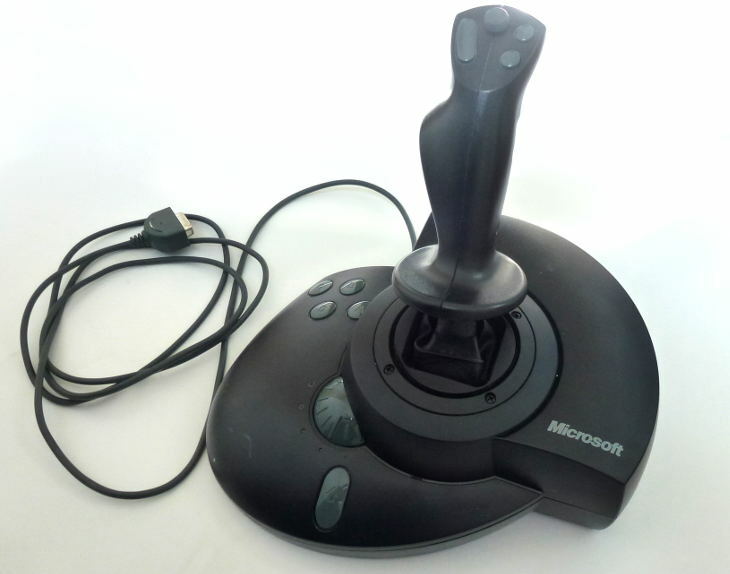 On June 19th 1997 Microsoft announced the SideWinder Force Feedback Pro joystick at the Electronics Entertainment Expo show in Atlanta Georgia. 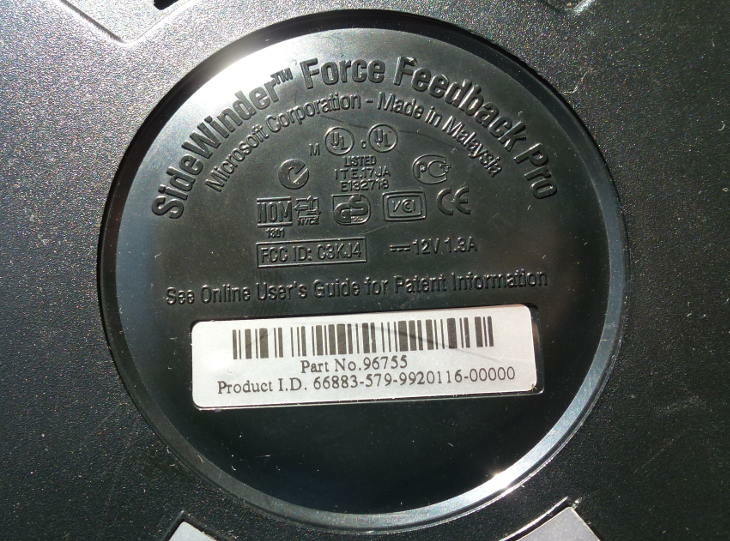 The Microsoft SideWinder Force Feedback Pro. The stick had two built-in electric motors and was able to produce physical forces through the grip of the joystick to add a tactile element to the gaming experience. It came with it’s own substantially sized power supply that was required to provide the surprisingly powerful motors with the juice they needed. At the time of launch it had 20 major publishers including EA, LucasArts and Activision ready and eager to add support for it in their games. It was a big and fairly heavy unit with a particularly comfortable ergonomic grip and used Microsoft’s latest digital-optical technology to provide ultra precision analogue control. One of the features that separated it from the competition was the fact that it had it’s own on-board 16 bit processor. This allowed the joystick to process and administer the force feedback effects without putting any extra processing burden on the computer to which it was connected. This was an attractive feature to gamers of the day as it meant using the joystick would not negatively impact on the performance of the games they were playing. The base and stick buttons. It had 8 programmable buttons, 4 on the left hand side of the base, 3 on the top of the stick and the usual trigger button. There was also a button at the rear of the base that could be pressed to activate alternative functionality to these programmable buttons. It also had an 8 way POV (point of view) hat switch on the top of the stick, a rotational ‘throttle’ control and the ability to rotate the grip of the stick for extra functionality. The cost at launch was $150. 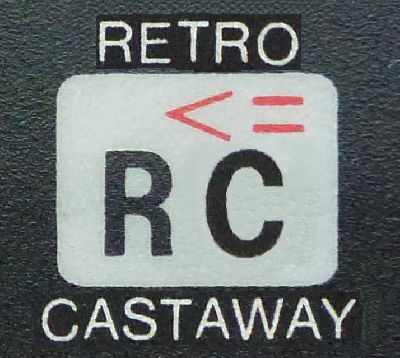 The identification label on the underside of the joystick base. It’s a well made stick and our unit is still in good shape to this day despite being over 16 years old. We’ve spent many a happy hour using it with ‘Battle of Britain 2: Wings of Victory’, ‘Microsoft Flight Simulator’ and ‘Microsoft Combat Flight Simulator’ to which this stick added significantly to the experience. The sensation of the stick rumbling and rattling as your wheels trundle along the bumpy grass of the airfield is very satisfying. So to is the contrast as you’re wheels leave the ground and the stick rumbling ceases leaving you free and easy in the clear blue sky with just the forces of flight now felt through the stick. Most memorable of all is the shocking moment you close in on a seemingly lone enemy fighter and just as you’re about to press home your attack the stick judders ferociously as your prospective victim’s unseen wing-man hits you with his 20mm cannon shells. for a very reasonable price (between £10 and £20 at time of writing). 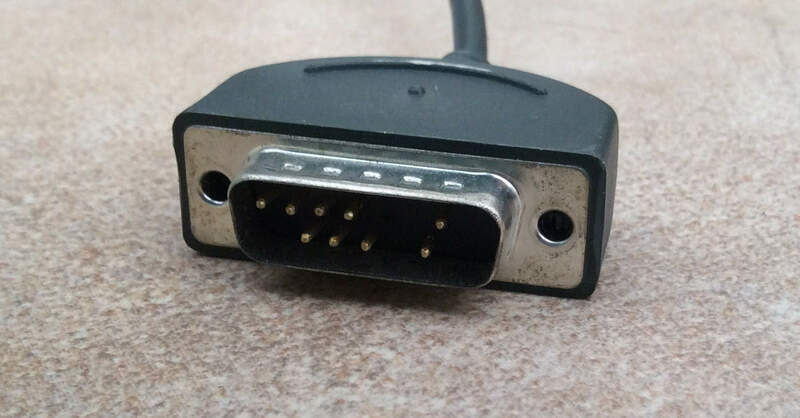 There’s just one problem…it’s got a Gameport connector which you just don’t see on modern PCs and it has no USB option. 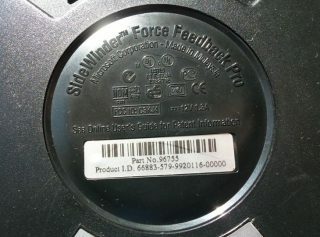 The Gameport connector on a SideWinder Force Feedback Pro. We’ve been looking online and can see that some people have had success building external circuits to convert this stick to USB. There are ready built converters available online but these don’t always seem to work well with this stick so there is some risk to investing in one of these. We love this joystick though so we’re keeping ours to use with our retro PC and may even get the soldering iron out in the future to give it a second lease of life on our modern set up. If anyone knows a good way to get this beauty working with USB please let us know using the comments below.